Sorrrrrrrrry, bookworms! I'm a day late with A Twist in the Tail. along with my review of her novella BLOOD & WATER! Here's her interview about ENCHANTED!. a flash fiction piece entitled "Well Behaved Mermaids Rarely Make Fairy Tales,"
a guest post on "Families in Fiction,"
a guest post on "The Real Peter Woodcutter,"
and two of her famous fairy tale rant videos, one about Rapunzel and one about Cinderella and how it inspired her novel ENCHANTED! 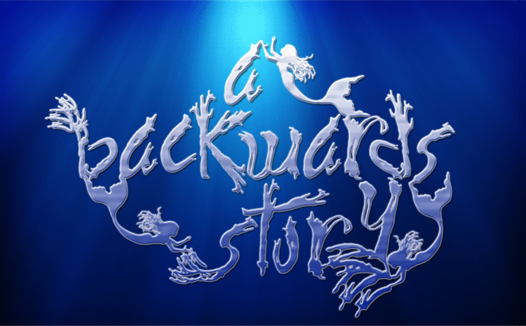 Stop by A Backwards Story next week for a brand-new guest post with Alethea! CONRAD SLOWED HIS PACE, not because he lacked energy, but because the hard calluses on his feet had cracked and started to bleed. It had been a long, dry road from Rose Abbey, part of an even longer road that had begun in the slums of Sandaar. Conrad's battered feet had trod the length of this continent from the fiery south to the frozen north, but his soul had yet to find its destination. Omi had told him this journey would end when he found the place where his heart waited for him. He hoped Omi had not died at the hands of the sultan. 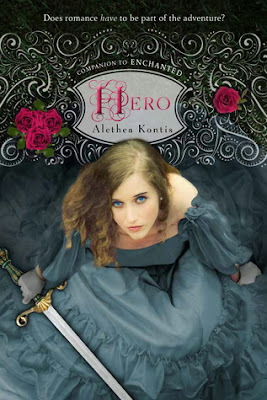 If you're looking for something fun and whimsical set in the framework of a fairy tale, look no further than an Alethea Kontis novel. Kontis excels at mixing together tales and making them work together. Her books are always a delight, and DEAREST is no exception. It conforms to the high expectations I've heaped upon it--the poor dear. All I want is for each book to be as good as the last, and so far, Kontis has yet to let me down. You can read all of Kontis' novels as stand-alones because they are individual stories about various members of the Woodcutter family. In DEAREST, you can see the happily wedded couple from ENCHANTED, but there is little reference to HERO because both books are occurring simultaneously in different areas of the world. DEAREST is dealing with the aftermath of an event that occurs in HERO without it being spoilery. In DEAREST, we're introduced to Friday, a gentle soul who isn't destined to shake up the world like some of her other sisters. She's reliable and steady, and after her sister Saturday breaks the world and brings tragedy to Arilland, it is Friday whose role begins to shine. Through her very nature, she is able to gather people around her and make them love her. Children are eager to help perform chores. Men and women alike turn out to help provide food and help Friday's friend Elisa gather up thistle for the important task of turning her enchanted brothers back into human boys. Friday is especially eager to help break the enchantment because she has found her heart with one of the enchanted princes, Tristan. When the sorcerer who cursed the family arrives in Arilland and threatens war, all that Friday and her new friends have been fighting to save is in peril. Can love once again save the day, or is the kingdom finally lost once and for all? "Friday had always considered herself to be equal among her siblings, but by the time the ship finally came to rest in the harbor, she felt she had finally lived up to the Woodcutter name." One thing I love and appreciate so much about Kontis is how each book gets so much deeper and darker. ENCHANTED is the most frivolous and light of the three, the most traditional and straight-forward. It reads like a feel-good, whimsical tale of old and takes readers away. HERO is still my favorite of the three--something about that book just exploded my head, and I love the way the climax was handled. There's so much action and adventure and it's a thrilling page turner. DEAREST is a combination of the two. So much of the book reads straight-forward, and then the action ramps up in the back-half. There are some dark, twisted scenes I wasn't expecting, but they work so well. I can't wait to see what sort of journey lies in store in the next Woodcutter book from Kontis. I like the way so many of the tales used in DEAREST had a common thread this time around, streamlining them concisely in an "Oh, of course it should work!" sort of way, rather than the "Wow, I can't believe that worked, how cool," sort of way I enjoyed in ENCHANTED. I could read fairy tale mash-ups from Kontis forever. Not just from the sisters, but from extended family, too, once she runs out of those. I want to stay in this world and not let go. 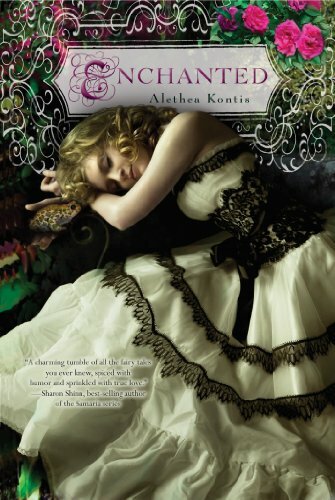 Kontis has a strong way of evoking imagery through her words, and of balancing both the darkness and the whimsy of a fairy tale, mixing everything together and delivering an enchanting story that's hard to put down. Not my favorite of the covers, but I like the way it invokes a hint of the tale lying within. That swan is hinting at things to come. This cover has more of a classical feel to it, like the paintings you see of girls sitting by the lake with swans in the background. At the same time, swans play a heavy role in this novel, so.... it does work! I really like the way Houghton Mifflin Harcourt etches the design into the swirls and curliques around each book's title. You don't see them unless you look. Look carefully...can you see the two swans? In her third book about the delightful Woodcutter sisters, Alethea Kontis masterfully weaves The Wild Swans, The Goose Girl, and a few other fine-feathered fairy tales into a magical, romantic companion novel to ENCHANTED and HERO. 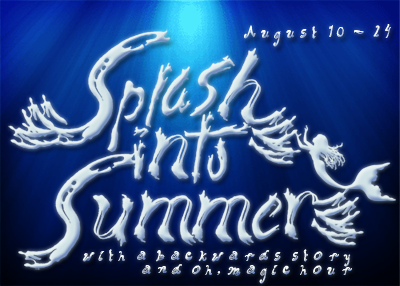 when Alethea stops by for a guest post. so I decided to review it today and give my lovely fellow bookworms the chance to enter the giveaway a little early! (Stop back on THURSDAY for my official tour stop! 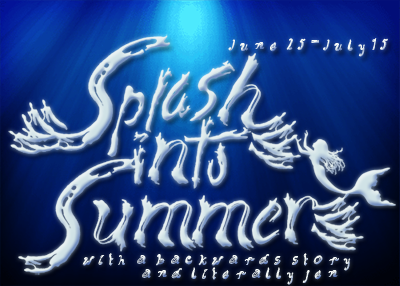 ...I'm unofficially giving you access to the giveaway today because it's already running! Stop at these blogs for more DEAREST fun! 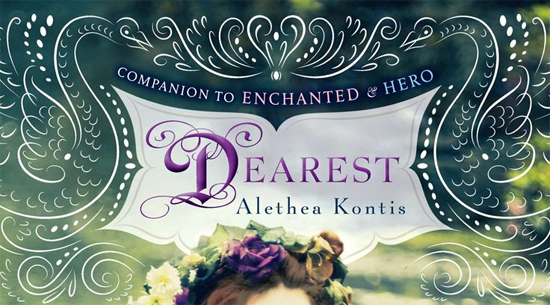 Win (1) of (3) Woodcutter Series Prize Packs, which include signed copies of ENCHANTED, HERO, and DEAREST! I'm super excited about this book! Loved the other two and want more woodcutters! I've been intrigued by this series for a while. 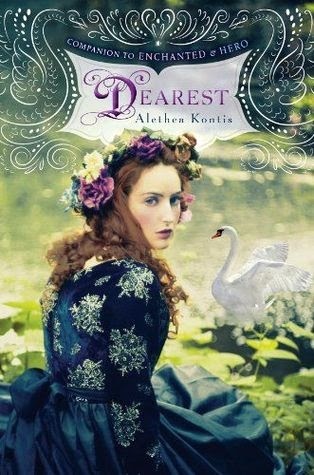 I was going to binge read this series thinking Dearest was the last one, but apparently there is still more to come.